Knee menisci, two in number, are made of fibrocartilaginous tissue and present one each between lateral condylar articulation and medial condyles of tibia and femur. Knee meniscus or simply meniscus refers to either the lateral or medial fibrocartilaginous structure. The menisci are also known as semi-lunar cartilages because of their crescent shape. Not very long ago, menisci were thought to be mere shock absorbers and were frequently removed in case of injury. But deterioration of articular cartilage and the gradual development of arthritis following meniscus removal changed the mindset towards the preservation of meniscus. Both menisci are critical components of a healthy knee joint. Menisci are crescentic, fibrocartilaginous, smooth glossy-white, crescent-shaped tissue that attach to the intercondylar area and periphery of the tibial plateau. Lateral meniscus display greater variety in size, shape, thickness, and mobility than medial. Two surfaces – The upper surface is concave for articulation with the femur. The lower surface is flat and rests on the peripheral two thirds of the tibial condyle. The peripheral thick part is vascular. The inner part is avascular and is nourished by synovial fluid. The medial meniscus is nearly semicircular, being wider behind than in front. The posterior fibers of the anterior end are continuous with the transverse ligament. Its peripheral margin is adherent to the deep part of the tibial collateral ligament. The lateral meniscus is nearly circular. The posterior end of the meniscus is attached to the femur through two meniscofemoral ligaments. The tendon of the popliteus and the capsule separate this meniscus from the fibular collateral ligament. The larger semilunar medial meniscus is attached more firmly than the loosely fixed, more circular lateral meniscus. Lateral meniscus also covers a larger portion of the tibial plateau than medial meniscus. The meniscofemoral ligaments are also known as the Humphrey and Wrisberg ligaments. 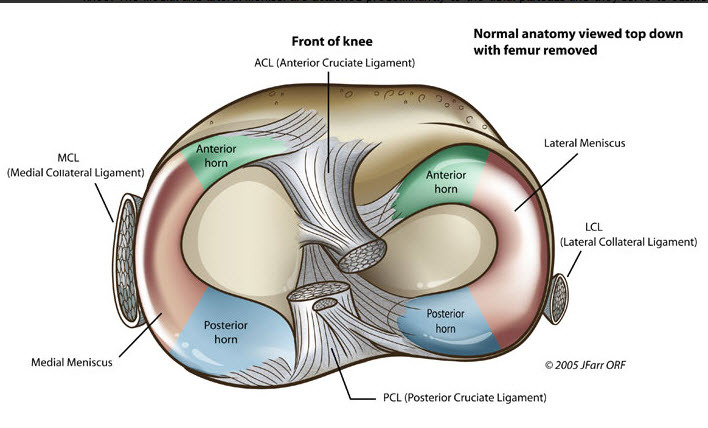 They connect the posterior horn of the lateral meniscus to a location near the insertion site of the posterior cruciate ligament on the medial femoral condyle. Only 46% of people have both of these ligaments but each one of us has at least one of them. The lateral meniscus is 32.4-35.7 mm in length and 26.6-29.3 mm wide; medial meniscus is about 40.5-45.5 mm long and 27 mm wide. The joint capsule attaches to the entire periphery of each meniscus but adheres more firmly to the medial meniscus. The more medial part of the tendon of the popliteus is attached to the lateral meniscus. The mobility of the posterior end of this meniscus is controlled by the popliteus and by the two meniscofemoral ligaments. Contraction by the popliteus during knee flexion pulls the lateral meniscus posteriorly, avoiding entrapment within the joint space. The medial meniscus does not have a direct muscular connection. The medial meniscus may shift a few millimeters, whereas the less stable lateral meniscus may move at least 1 cm. The meniscus is highly hydrated. Almost 72% of the meniscus is water. Remaining is comprised of extracellular matrix and cells. Majority of non-water or organic composition is by collagen (75%), glycosaminoglycans (17%), DNA (2%), adhesion glycoproteins (<1%), and elastin (<1%). The proportion may vary with age. Different types of collagen exist in varying quantities in each region of the tissue. The main type of glycosaminoglycans in normal human meniscal tissue is chondroitin sulfate, dermatan sulfate, and keratan sulfate. Aggrecan, biglycan, and decorin are the proteoglycans found in meniscus enabling the meniscus to absorb water. Adhesion glycoproteins fibronectin serve as a link between extracellular matrix components and cells. During early development, all meniscus cells present the same cellular morphology but then with development, changes occur in the cells. Cells in the inner portion of the tissue appear more round and more like cartilage cells. These are classified as fibrochondrocytes or chondrocyte-like cells. The menisci follow the motion of the femoral condyle during knee flexion and extension. During extension, the femoral condyles exert a compressive force displacing the menisci anteroposteriorly. As the knee moves into flexion, the condyles roll backward onto the tibial plateau. The menisci deform mediolaterally, maintaining joint congruity and maximal contact area. As the knee flexes, the femur externally rotates on the tibia, and the medial meniscus is pulled forward. The menisci are important in load-bearing, load transmission, shock absorption, as well as lubrication and nutrition of articular cartilage. Being wedge-shaped, these help in stabilizing the curved femoral condyle during articulation with the flat tibial plateau. Menisci are compressed in the day to day activity. The wedge shape of the meniscus and its horn attachments serve to convert the vertical compressive forces to horizontal stresses. Thus they spread the body weight load. The blood supply to the menisci is limited to their peripheries. The inner part is avascular. The blood supply is derived from the medial and lateral geniculate arteries which anastomose into a parameniscal capillary plexus. The blood supply decreases with age. The region of the meniscus with blood supply is able to heal itself better than avascular one. Two distinct regions of the meniscus can be distinguished: the outer, vascular/neural region (red-red zone), and the inner, completely avascular/aneural region (white-white zone). These two areas are separated by the red-white region. Menisci make the articular surfaces more congruent. Because of their flexibility they can adapt their contour to the varying curvature of the different parts of the femoral condyles, as the latter glide over the tibia. The menisci serve as shock absorbers. They help to lubricate the joint cavity. Because of their nerve supply, they also have a sensory function. They give rise to proprioceptive impulses. Menisci deepen the articular surfaces of the condyles of the tibia and partially divide the joint cavity into upper and lower compartments. Flexion and extension of the knee take place in the upper compartment, whereas rotation takes place, in the lower compartment. Abnormal forces may result in meniscal tears or injuries. These are injuries mostly occur in sports. Degenerative meniscus tears occur in old people.